A walk-in is a new age concept of a person whose original soul has departed his or her body and has been replaced with a new soul, either temporarily or permanently. Do you ever feel you are not from this planet, timeline, or dimension? Do you feel that your soul came here to live out certain experiences ... then something life-changing happened and you became another person - more evolved with a mission to heal and help humanity? Such is the journey of the walk-in. Interest in the "walk-in" phenomenon was initially stimulated in the 1970s by the popular "Seth Speaks" series of occult books written by channel Jane Roberts, as reputedly authored by her various "spirit-world" benefactors. In 1979, author Ruth Montgomery contributed to the fascination with Strangers Among Us, a collection of accounts of walk-ins. She included prominent historical figures among her subjects, such as Thomas Jefferson as having hosted walk-in spirits who actually wrote the Declaration of Independence. Subsequently, a belief system grew up around the walk-in. It included New Age attributes such as the concept of ascending into higher frequencies of evolution, a variety of psi powers, traditional "predictions regarding Earth Changes" first cited in the Bible (Book of Daniel and the Book of Revelation) but popularized by Edgar Cayce, and predictions of dire fates for those whose vibrational levels remain in lower frequency. In the late 1980s and early 1990s a channelling team known as "Savizar and Silarra" (Extraterrestrial Earth Mission), emphasized their walk-in status, claiming successive walk-in experiences together with corresponding name changes. The New Age walk-in belief system now includes a number of variant experiences such as channeling, telepathic contact with extraterrestrial intelligences, or soul merging, where the original soul is said to remain present, coexisting or integrating with the new one. For the most part, walk-ins are higher frequency aspects of someone's soul, here to heal and help during this time of transition. Once they allegedly enter a person, often after a traumatic experience, serious illness, or New Death Experience, the person's grid consciousness is forever change always going from negative to positive. Walk-ins were featured on the June 4, 1999 segment of the Unsolved Mysteries television series. According to information presented on this program, there are walk-in conventions, one of them drawing approximately 500 people. Souls experience in many grid realities simultaneously. As of 2011, there is an increasing number of people claiming some type of walk-in experience, which has to do with souls in different realities merging back into One, as the consciousness hologram of our experience ends. Walk-in is an ancient concept first described in Hinduism whose modern name originated in the Spiritualist faith and was popularized by the related, but not identical New Age movements and beliefs. A walk-in is thought to be a person whose original soul has departed his or her body and been replaced with a new soul. Walk-ins first appear in Hindu sacred literature. In Hindu belief, each person is comprised of several bodies, including the physical, astral, mental, refined, and so on. The only essence that is not a body, and therefore not tranferable, is the Atman. So according to this belief system, a walk-in, as described in the book Merging with Siva by Sivaya Subramuniyaswami, can take one or many of these bodies. The most famous Hindu story of a walk-in is that of the missionary Saint Tirumular. Legend has it that he voluntarily left his body in order to reanimate a young cowherd who had just died. His own body was subsequently taken up to heaven by the god Siva, leaving him to spend the remainder of his life on earth in the body of the cowherd. He was able to access the dead man's knowledge, including his ability to speak Tamil. In modern times, "true" or sincere walk-ins might be a rare but possibly real medical or mental health phenomenon. A typical walk-in report involves an individual (frequently, but not always, female) who is badly injured, falls ill or is in some way incapacitated, or seems to "die" on the operating table during surgery, perhaps later reporting a near-death experience. Others claim that deep emotional trauma and suicidal desires alone may set the stage for a walk-in experience. After resuscitation, the person may behave in a manner completely at odds with earlier, established behavior patterns. She or he may speak in an unknown language and identify by a different name, and may be very frightened and confused, or supernally calm. While the experience cannot be determined to have any objective reality, subjectively it is deeply and importantly real for the affected individual. Almost invariably, a walk-in will state they either do not know where the original inhabitant of the body has got to, or that the original soul has left it and gone on to heaven, or reincarnated, etc., leaving them in charge. The new individual may claim he or she is an angel; a "new" version of the former self; an older, more experienced soul; less often, a brand new one who has never incarnated before; or any manner of other origins. Many walk-ins claim heightened psychic sensitivity and may take up work as New Age healers or ministers. Others claim inability to accomplish basic tasks of daily living. Clearly, at least for some, claiming a walk-in experience may have a number of secondary gains. While the New Age belief system about walk-ins claims that these transitions can't occur involuntarily and that no soul walks into another's body without reason, the behaviour of some "new" people indicates that it may not always be so. In classical cases, the change is immediately apparent. However, in cases where the "new soul" has enough information to take up the life of the "previous occupant" seamlessly, it may take weeks or months before a walk-in notices, or comes to believe, that a transition has indeed occurred. Occasionally, the "old self" returns after a period of months or years, and either the "new self" departs, or they coexist and may try to integrate into a single being, or work out a means of cooperation and live as two persons in one body. This kind of walk-in is very similar to old-time, pre-Sybil cases of multiple personalities such as Mary Reynolds. A period of unconsciousness is followed by the manifestation of a new self. William James studied Reynolds and Ansel Bourne, and thought of multiple personality as something natural but not yet understood, rather than a mental disease. Boris Sidis in his 1903 book Multiple Personalities recorded similar cases, involving both men and women. In 1979, Spiritualist author Ruth Montgomery published Strangers Among Us, a collection of accounts of walk-ins. She included her own New Age theories and some improbable historical research, naming some renowned figures such as Thomas Jefferson as walk-ins. This and her follow-up book Threshold to Tomorrow brought the concept of walk-ins to the general public. 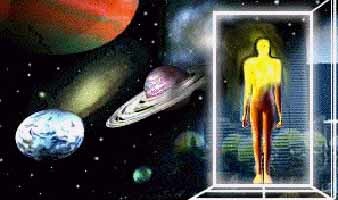 A belief system grew up around the walk-in experience, complete with all the usual New Age attributes such as "ascending into higher frequencies of evolution", predictions regarding Earth Changes, and the concept that the new person may possess a variety of psi powers unknown to ordinary human beings whose "vibrational levels" remain in lower frequencies. The New Age walk-in belief system now includes a number of variant experiences such as channeling, telepathy contact with extraterrestrial intelligences, or soul merging, where the original soul is said to remain present, coexisting or integrating with the new one. As of 2006, an increasing number of people claim some type of walk-in experience. Walk-ins were featured on the June 4, 1999 segment of Robert Stack's 'Unsolved Mysteries'. According to information presented on this program, there are now walk-in conventions, one of them drawing approximately 500 people. Checklists to determine walk-in status include name changes, career changes, new interest in the study of psychic phenomena, a feeling that one is not really from Earth, or a sudden desire to move to a new environment. Reported physical changes include memory loss and the sudden onset of allergic reactions. Since all of these factors could possibly be attributed to simple life changes such as adolescence or middle age, it's difficult to determine solely from such a checklist if a "true" walk-in has occurred. The most logical method might be to determine if any specific event historically connected with walk-ins (anesthesia for surgery is one of the most common) occurred around the time one first started feeling differently. There is, however, no known scientific method to prove whether or not the walk-in experience has any objective reality, let alone how to determine if one has occurred. The belief system states that all souls come to earth in order to accomplish missions of cosmic significance, and that a walk-in is a highly evolved soul who is here to help raise the vibrational levels of humanity and doesn't want to bother with the tedious process of incarnating in the usual fashion (i.e., birth). Walk-ins, according to New Age teachers, are not perfect like Ascended Masters, but are invariably more spiritual, compassionate and sympathetic than the original person. This interpretation is sometimes disputed by the spouses of people who abruptly discontinue marital relations on the grounds that they are not the person whose name appears on the wedding license or that carnal love is not for those of higher vibrational frequencies. Separation, divorce, and remarriage are very common to the New Age walk-in experience. The "otherkin" community defines a walk-in by the standard definition, with the caveat that people with multiple personalities may have one or more perceived entities in their body who "walked into" the body of their host, without the host needing to depart; they believe this can happen right after birth, or later in the life of the person concerned. Such a person is described as an otherkin host, or simply as a host, and the foreign entity residing in them would be a walk-in. The theorised origins of these souls vary. Some are thought to be human or animal spirits; others, creatures usually considered mythological; or extraterrestrial intelligences. They are thought to share the body space and take turns using the body, usually with permission and awareness. Unlike the classic or Sybil-like description of multiple personality disorder, these groups of minds usually report getting on rather well and contribute energy and ideas to the host individual's life goals, as well as helping with activities of daily living. Another phenomenon often confused with the abovementioned and classical walk-in experience is hosting. A host is a person who believes he voluntarily shares his body with other souls, usually but not necessarily since birth, while retaining his own consciousness and sense of self. A person who believes he's sharing his body with otherkin walk-in spirits can said to be hosting; but according to reports by people who experience hosting, not all hosted spirits are walk-ins, nor are they necessarily otherkin. Some hosts claim that the presences they experience as residing in their body are simply the spirits of deceased relatives, or friends or lovers from past lives. This is very similar to the description given by old-time Spiritualist mediums who believed they could allow a departed loved one or a spirit guide to take up residence in their body temporarily or permanently. These mediums were the first to have the term "multiple personalities" applied to them. They experience a sharing of space and body time with the perceived spirit, usually with mutual respect and caring uncharacteristic of stereotyped MPD behavior as reported by psychiatrists. 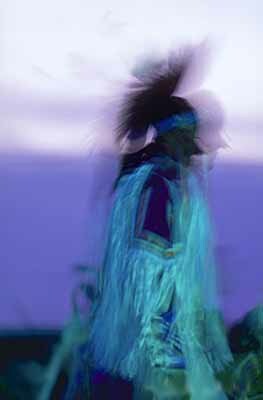 The concept of voluntary possession or sharing of the body by more than one spirit is well known in many indigenous cultures. One of the central practices of Vaudon is to allow gods and saints to take temporary possession of human bodies, to give advice and help to all the people. Folk healing on the island of Bali can involve ceremonies in which departed ancestors take over a living body for the same purposes. For the ceremony called Sanghyang Dedari (external link), two little girls are specially trained to become temporary vessels for a pair of angels, Tunjung Biru and Dewi Supraba, who come to remove bad luck and sickness from the village at the end of the monsoons. In some Gulf Coast Indian tribes, leaders and healers are chosen from "those who have the most spirits living inside them." Generally, hosts say they are able to change body control between the persons residing in their bodies at will; in such situations, they feel that the main or host self (in most cases, this is the soul of the original inhabitant) simply "takes a step back" and lets another entity "come forward" to control the body. People who find themselves in a hosting or walk-in situation are also in a larger category, generally referred to simply as "multiples" by the other-kin community. Some other-kin multiples, and other people in walk-in hosting situations, stress that it is important to make a distinction between themselves and people who experience DID (Dissociative Identity Disorder). On numerous websites and Internet forums (where a certain amount of anonymity is possible), these people report being aware of the others and able to communicate and cooperate with them, again in contrast to standard popular and psychiatric conceptions of MPD or DID. Such people often prefer to use internally-referential terms such as "people" or "selves" over the popular "personality" or psychological term "alter", which are considered misleading through the implication that each perceived internal entity is not a person in his or her own right. Scott Mandelker wrote a book called From Elsewhere describing the feeling of being an alien from another planet who has wandered here at this time in Earth's planetary transition back to light. Wanderers are thought of as souls connected to another place, planet, or realm, who have come here on a mission, after which they will return home. That is true of all souls in this experiment, though Wanderers often feel disassociated. They do not always remember what their mission is, as the 'mission feeling' is present in the DNA codes of all humans. Sometimes Wanderers believe they have come here to prepare humanity for coming changes - perhaps a visit from ET's or moving into love and light, etc. All awakened souls ... moving through the healing process into balance and higher consciousness, move into this line of thought. It is not special and becomes more commonplace in the passages of time. A Wanderer who cannot find their mission will become depressed and can develop fear, panic and anxiety, attracting various negative paranormal experiences. Again - it is important to determine if the person has a Personality Disorder. All souls are Wanderers in this consciousness experiment, experiencing in many realities simultaneously. It ends at Zero Point when all souls leave the physical and return to higher consciousness as soul sparks of light. Combining breathtaking visuals of realistic depictions of a variety of places in our solar system - kindly detailed by Wernquist here -- with the ever-mind-expanding words of Carl Sagan, pulled from an audio recording of his book "Pale Blue Dot," Wernquist tempts readers to wonder what lies beyond our atmosphere and visualizes what it would be like if humanity happened to make that journey in the future. Take four minutes out of your day and be inspired by the exceptional creation above. "Wanderers" is a short science fiction film by Erik Wernquist - a digital artist and animator from Stockholm, Sweden. Wernquist notes that the film is a vision of humanity's future expansion into the solar system. Although admittedly speculative, the visuals in the film are all based on scientific ideas and concepts of what our future in space might look like, if it ever happens.